Cologne 2005, August 16 - 21 - Belgian Sr. Johanne Vertommen dances with missionary priest Fr. John in two close-ups of World Youth Day 2005. These pictures were published by the Flemish daily Het Laatste Nieuws. When a reporter asked Sr. Johanne about her dancing poses, she answered: "My superior mother raised the issue today. She thinks I should watch out a bit and bear in mind that I represent our community." As justification for her behavior, Sr. Johanne added: "I wouldn't do this at home, but on such occasions I get carried away by the enthusiasm of the group." If Sr. Johanne and Fr. John did this in open daylight in front of news cameras, one can only wonder what actions their unconstrained "enthusiasm" would lead them to do when alone together. 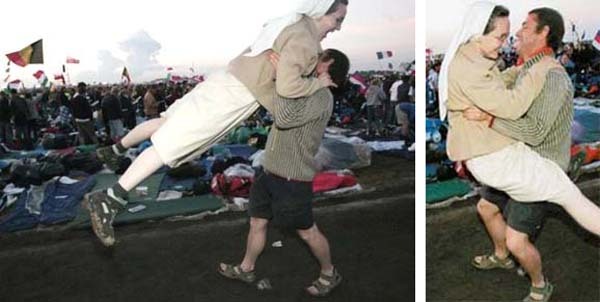 Also, if religious persons indulge in this kind of "enthusiasm" typical of a World Youth Day, what can one imagine regarding non-married couples who are allowed to sleep together throughout the six-day encounter?